Come along with us on an epic journey across 500 million years of history & unearth the ancient, and more modern, beginnings of Flagstaff, AZ. A comfy and view-filled drive from downtown Flagstaff (116 W. Phoenix) into the surrounding areas. During the warmer months we will stop at a couple interesting historical locations and walk around. 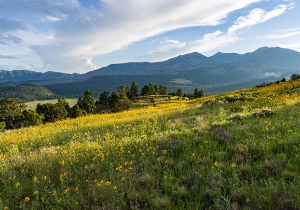 Enjoy an interactive presentation from a Flagstaff local and area expert. Learn about volcanoes, the Southwest, how Flagstaff got it’s name, Route 66, NAU, Lowell Observatory and so much more! Guests ages 8+ are welcome. If you have questions about suitability, contact us as at any time. Discover the eclectic and interesting past that defines our high-altitude mountain gem. 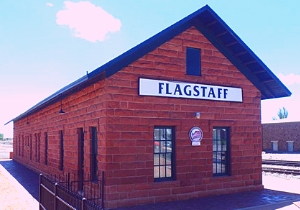 Whether you are a visitor to Flagstaff, new to town, or a long-time resident, you will love our Flagstaff Beginnings City Tour! View the calendar on this page for available dates and times. Join us for a fun interactive time, that will leave you with a deepened sense of connection to our town and a wonder for the world around you. Can’t make one of our guided tours? Check out the self-guided tour and enjoy it on your own time. Each section of our drive will be packed with interactive talks and interesting sights. Your participation and questions are always encouraged! Our journey though Flagstaff will take us through areas such as: McMillan Mesa, Coconino Estates, the Flagstaff Monument, Old Town, Route 66, Milton Road, NAU and more. Our Journey through time will take us across hundreds of millions years of natural and cultural history. From ancient seas to fiery volcanoes to indigenous cultures and the first European settlers, we cover it all! What to Wear | This tour will generally be a mixture of driving and light walking unless the weather does not permit. In the winter and early Spring, we will likely stay on the bus most of the tour. From late spring to fall, we will get out of the bus and walk around at a couple different locations. We recommend good walking shoes and clothes appropriate to the season of your tour. 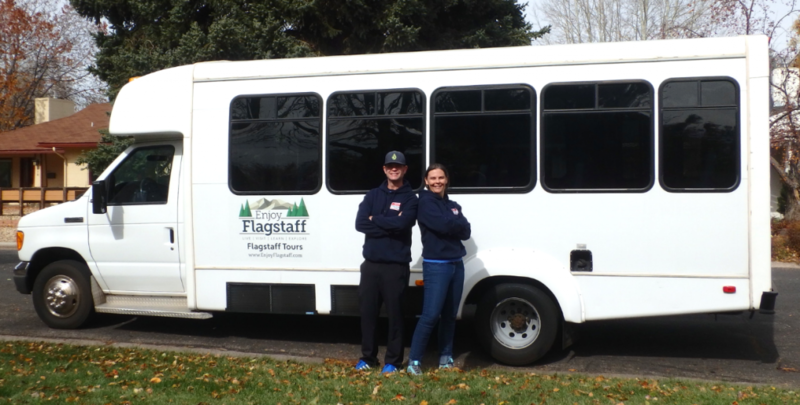 Layers generally work best in Flagstaff, and we have plenty of storage room on the bus if you need to stow items. Our tour bus has heat and A/C available, but you know your own tolerances better than us. Please plan accordingly. Though water and a snack will be available on the bus, you may want to consider bringing your own as well. Season | Year-Round – Some tour details may change due to weather, season, traffic or other factors out of our control. 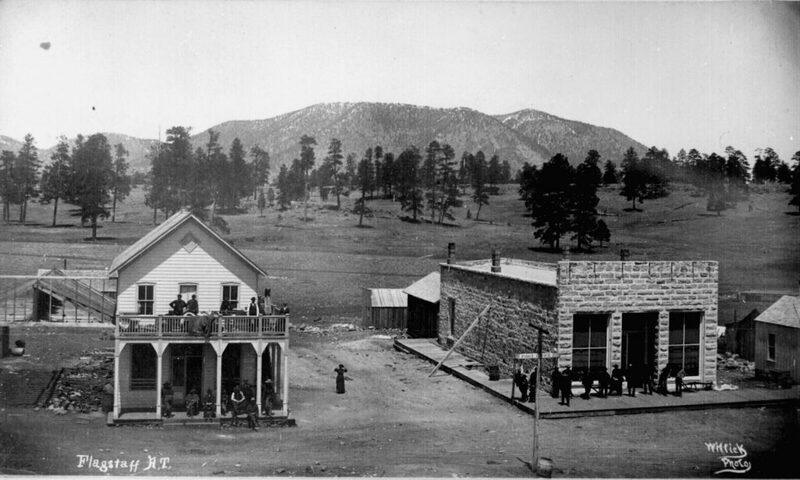 Physicality | 5/10 – The Flagstaff Beginnings tour is on the lower end of our physicality scale. Contact us with questions. Cancellations received more than 48 hours prior to your scheduled tour date will be refunded in full minus a 5% processing fee. No refunds will be made for cancellations within 48 hours of your tour date. If you are concerned about the possibility of cancelling your tour we recommend travel insurance. Guests that do not show for their scheduled tour will be charged the full cost of their trip. Safety is our number one priority. In case of inclement weather or other unforeseen circumstances, we reserve the right to cancel a tour at any time. We will refund the full tour cost to guests in the instance that the operator cancels a tour. We will attempt to inform every guest as early as possible should a cancellation occur.